I remember exactly where I was when it happened–the moment that Oregon lost the national championship game to Auburn in 2010. I was with about 30 of my fellow students in my buddy’s apartment across from Hayward Field. The Ducks lost that day, but they will get a shot at redemption in the not-too-distant future. You might have heard- Oregon will play Auburn at AT&T Stadium on August 31, 2019–another shot at the SEC and national respect for the Ducks. 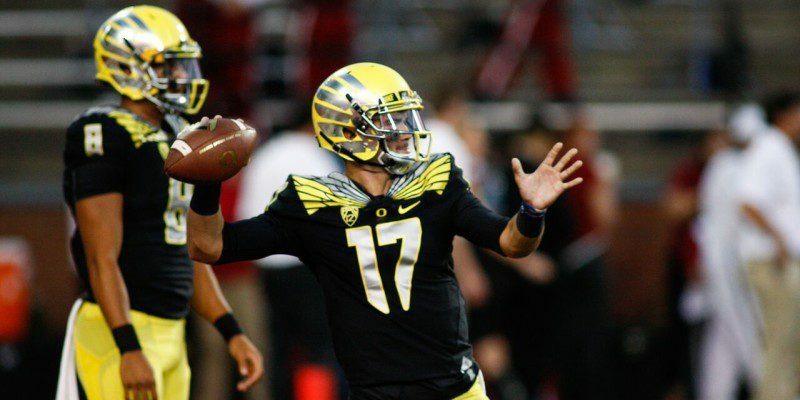 But who knows, Oregon could win a national title — or more — before then. The 2015 season hasn’t even started yet, so speculating on who will win four years from now is a bit much at the moment. However, just learning about that type of match-up speaks volumes about the program and the heights Oregon has reached. “An invitation to participate on a stage like this speaks to the reputation Oregon football has earned, and we’re excited to be part of such a prestigious match-up,” Oregon athletic director Rob Mullens said, according to Ryan Thorburn of The Register Guard. 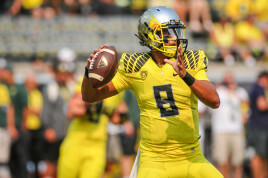 Marcus Mariota was a big reason Oregon stole a victory from the Spartans last season in Eugene. His replacement will need to play well early this season if the Ducks want to win on the road. While the Ducks’ future schedule has added some firepower for 2019, the non-conference schedule, as a whole, until 2021 is looking great. The home-and-away series with Michigan State has increased the television exposure of the program and also has proven to be huge for the Ducks resume come play-off time. In fact, the non-conference win over the Spartans last season was likely a key reason the Ducks finished the year at No. 2, and neither TCU nor Baylor – who both lacked non-conference wins over ranked opponents — were chosen to participate in the College Football Playoff. In my opinion, the Ducks have now ascended to a consistent top-10 program and should be able to maintain that status for at least the foreseeable future. So what is to come in the years ahead, and what does the non-conference schedule look like? Well, as it turns out, Duck fans will get to see more teams with great traditions in Autzen Stadium for the upcoming years. After this season wraps up, the Ducks will begin a home-and-away series with the Nebraska Cornhuskers on September 17, 2016. Oregon will travel to Lincoln to face-off against the Cornhuskers before returning to Eugene for a rematch the following year. The two teams haven’t played each other since 1986 — a 48-14 Nebraska victory — but that doesn’t mean they are completely unfamiliar with one another. Former Oregon State head coach, Mike Riley, is now the head coach at Nebraska and likely will be when the teams face-off in 2016 and ’17. Also, Oregon offensive coordinator, Scott Frost, won a national championship while playing quarterback for Nebraska in 1997. That familiarity between the coaching staffs is definitely something to keep an eye on as the match-up approaches. As far as Oregon’s non-conference games go, Nebraska could be the most traditionally dominant school to play the Ducks out of conference since Michigan in 2007. This match-up is going to be a big deal when it happens. Next season when Oregon heads to Lincoln, the Ducks will have to deal with the intense 87,000+ fans that pack Memorial Stadium and their active streak of consecutive sellouts, which currently stands at an NCAA record of 340 games. In fact, when Memorial Stadium is full, Lincoln becomes the third largest city in the state. Although I don’t believe it will be a 39-7 blowout such as Oregon’s ’07 trip to The Big House, the Cornhuskers are likely going to be the underdog and will have their hands full in this football game. Hopefully, Riley can improve the program and get them ranked when the Ducks face-off against them. After the Nebraska series, the Ducks’ schedule slows down for the 2018 season. Oregon was supposed to have a home-and-away series with Texas A&M, but it was cancelled because A&M switched to the SEC, according to an ESPN article from 2013. As of now, Oregon has only a home game against Bowling Green on the non-conference schedule for 2018. With the openings in the schedule, the Ducks have a chance to get a decent team that is also looking to fill dates in its schedule. However, due to Oregon’s prestige, Autzen Stadium’s home field advantage and the short notice, it is more likely that they will play Portland State and another team of that caliber. The next three years are revenge years. As mentioned earlier, Oregon will play Auburn in Arlington, Texas on August 31, 2019. Then according to ESPN, in 2020, the Ducks will host Ohio State in Autzen on September 12. That is the first game of a home-and-away series between the two schools that faced-off in last year’s national championship game. A year after facing the team the Ducks lost their first national title to, they get to host the team who kept them from the championship once again. Then Oregon will travel to Columbus for the final game in the series on September 11, 2021. 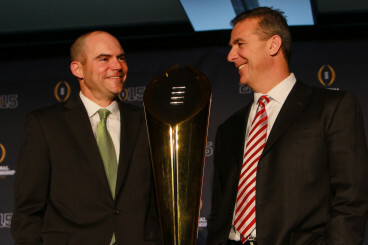 Mark Helfrich and Urban Meyer will likely face off again when this series kicks off in 2020-21. Ohio State will probably out-recruit the Ducks for the years leading up to their match-up, but I see both teams staying on the same trajectory and competing for championships. By the first game between the schools in 2020, I wouldn’t be surprised if either Oregon or Ohio State — maybe both — wins a title. This series has the potential to be the biggest non-conference games in Oregon history, considering how high both teams will likely be ranked — if they can maintain top-10 status, that is. If both teams keep improving and stay consistent, this could be a match-up of two top-5 teams with major national title implications. Hopefully, it will be an epic showdown between two perennial powerhouse teams. Scheduling non-conference opponents can be tough for a variety of reasons, but with the college football playoff here to stay, it seems more and more schools are willing to schedule tough out-of-conference games. Having a win against a ranked non-conference opponent — especially on the road — is huge for the resume at the end of the season — and teams will need those types of games to increase their playoff chances. The old days of consistent cupcake teams to fill the schedule are almost behind us. Now the old cliché is becoming true — to be the best, you’ve got to beat the best. While fans have to wait up to five years to see the match-ups mentioned above, Oregon certainly doesn’t seem hesitant to schedule top-caliber teams for its out-of-conference games.